Tuesday 24th February: Daily technical outlook and review. Weekly Timeframe: The weekly timeframe shows that ever since the rebound from the weekly Quasimodo support level at 1.1109 (26/01/15), price has been seen hesitating below a weekly supply area coming in at 1.1678-1.1458. A break above this supply could very well clear the path north up to a major weekly swap level seen at 1.1758. Daily Timeframe: Since the 12/02/15, the EUR/USD pair (as per the daily timeframe) has been seen consolidating between a small daily demand area visible at 1.1260-1.1318, and a daily swap level located at 1.1411. 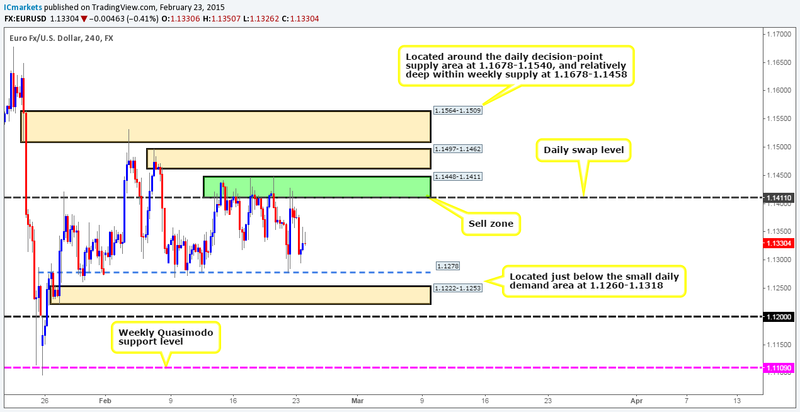 The 1.1411 barrier, in our opinion, remains a key obstacle to a move higher into the aforementioned weekly supply. 4hr Timeframe: Shortly after the market opened at 1.1388, the Euro sold off down towards the 1.1300 handle, which, as you can see, was clearly enough to support a counterattack back up to the 1.1358 mark. If price manages to get down to the 1.1278 level sometime today, we’d then begin watching for lower timeframe buying confirmation for a quick bounce/scalp trade. This level is particularly attractive due to the amount of successful bounces it has seen in the past. The reason why we’re not looking for a reversal here is simply because price is currently trading around the underside of a weekly supply (see above) at the moment. With regards to sell trades today, there are two areas that have caught our attention. The first, the higher of the two comes in at 1.1497-1.1462 where we still have a pending sell order set just below at 1.1457, since this zone remains relatively fresh, and is located just within the limits of the aforementioned weekly supply area. Nonetheless, before price can reach this area, we may see a reaction at what we like to call a 4hr ‘sell zone’ seen at 1.1448-1.1411 (tentative sell orders are seen just below at 1.1406), which is neatly positioned around the aforementioned daily swap level. Buy orders: 1.1278 [Tentative] (Predicative stop-loss orders seen at: dependent on where one confirms this level). Sell orders: 1.1406 [Tentative] (Predicative stop-loss orders seen at: 1.1450) 1.1457 (Predicative stop-loss orders seen at: 1.1503). Weekly Timeframe: The weekly timeframe shows that the buyers and sellers are currently seen pulling for position within the lower limits of a weekly swap area coming in at 1.5426-1.5561. Daily Timeframe: Yesterday saw the GBP/USD slightly close above a daily swap level visible at 1.5426. This move has very likely cleared the path north towards a daily supply area at 1.5619-1.5548 (positioned just above the aforementioned weekly swap area). 4hr Timeframe: The open (1.5391) saw sterling sell off down towards a 4hr swap level coming in at 1.5351, which, as you can see, was more than enough to support a rally above the aforementioned daily swap level. Our team is currently eyeing the recently broken daily swap level as an area in which to look for confirmed longs. A successful retest here would likely attract further buying up to at least the 1.5500 handle, which, incidentally would be our take-profit target should a long entry be seen. With regards to sells, we are keeping a close eye on 1.5500, since if price reaches this juncture, a reaction is very likely due to it being located deep within the weekly swap area mentioned above. However, entering with a pending sell order here would, for us anyway, be too risky. A more conservative approach may be to wait for price to show strength on the lower timeframes first before risking one’s money here. Buy orders: watching the daily swap level at 1.5426 for lower timeframe confirmation (Predicative stop-loss orders are seen at: dependent on where one confirms this level). Sell orders: 1.5500 [Tentative] (Predicative stop-loss orders are seen at: dependent on where one confirms this level). Weekly Timeframe: The weekly timeframe shows price remains trading just above a weekly demand area coming in at 0.7449-0.7678. Should a rally higher be seen from here, weekly resistance is not expected to come into the market until around the 0.8064 region. Daily Timeframe: The daily picture shows that for the past three weeks, price has been ranging between two daily swap levels (0.7844 and 0.7691). However, as you can probably see, price has recently been seen teasing the upper range resistance at 0.7844, which consequently saw a bearish reaction yesterday bringing price back into the range. 4hr Timeframe: Shortly after the market opened (0.7845), the Aussie pair aggressively sold off from the daily swap level at 0.7844, breaking 0.7800, and hitting a small 4hr demand area coming in at 0.7756-0.7785. Risk/reward parameters restrict us from entering long here with 0.7800 looming just above. A small break above and retest of this level could well be tradable (with lower timeframe confirmation) back up to the aforementioned daily swap level. In the event that price breaks below this aforementioned 4hr demand area, a continuation move down towards the 0.7700 level may well be seen. The reason why we believe price could drop thus far is simply because active demand to the left appears to have already been consumed – check out the clear demand consumption tails seen at 0.7741/0.7724 (pink trendline). However, do keep in mind that if one were to enter short on the break, you would effectively be selling to potential higher-timeframe opposition (weekly demand – see above), so strict trade management is a MUST. Buy orders: Flat (Predicative stop-loss orders seen at: N/A). Sell orders: Flat (Predicative stop-loss orders seen at: N/A). Weekly Timeframe: The weekly timeframe shows that price has recently closed just above the upper limits of a symmetrical triangle formation (121.83/117.43). Assuming that the buyers can hold out above this barrier, further upside could be seen this week up to around the weekly Quasimodo resistance level coming in at 122.18. Daily Timeframe: The daily timeframe reveals that price is currently being supported by a daily decision-point demand area coming in at 118.32-119.09. This support barrier does not look very stable in our opinion due to the break lower seen on the 17/02/15. In the event that price closes below this area, we’ll likely see renewed selling interest down to a daily demand area positioned at 116.86-117.54. 4hr Timeframe: The USD/JPY pair opened at 119.04, and after a little hesitation was seen, rallied higher towards a 4hr swap level coming in at 119.35. This has, in our opinion, confirmed price is now range bound between 119.35 and a 4hr decision-point demand area seen at 118.32-118.54. Trading within this range is a viable strategy (tentative buys seen at 118.56, and sells coming in around 119.30) and does indeed offer chance to profit. Nonetheless, we would recommend waiting for confirmation from the lower timeframes before risking your money here, since fakeouts are a common occurrence in consolidative environments such as this. Our team has just reported that they would much prefer to wait for price to break out of this range before trading this pair. With that in mind, if the market closes above 119.35, this would likely see a prompt retest forcing price up to at least the 120.00 handle. This is something our team would most definitely be interested in taking part in, and in addition to this, it would also offer some confirmation that the recent close above the weekly triangle (see above) was genuine. Conversely, a close below the 4hr decision-point demand area would likely offer shorting opportunities down to at least 117.86. If a break lower does occur, we would patiently wait for a retest before looking for confirmed shorts, as per the green arrows. Buy orders: 118.56 [Tentative] (Predicative stop-loss orders seen at: 118.27). Sell orders: 119.30 [Tentative] (Predicative stop-loss orders seen at: dependent on where one confirms this level). Weekly Timeframe: Although we’re currently seeing some recovery from the recent sell off on the weekly timeframe, the fact still remains that the weekly Quasimodo resistance level continues to hold the market lower for the time being. Daily Timeframe: The recent buying seen on the weekly timeframe was likely spurred on from a daily decision-point demand area seen at 1.2378-1.2468. In the event that further buying is seen from here and price breaks above the high (11/02/15) seen at 1.2696, it is very likely that the market will revisit the aforementioned weekly Quasimodo resistance level. 4hr Timeframe: The open (1.2528) saw the buyers take immediate control, which, as you can probably see, forced price above the 4hr supply area at 1.2572-1.2522 into another 4hr supply coming in at 1.2644-1.2611. It was here that selling opposition clearly began to overwhelm the buyers. If further selling is seen from here today, price will likely visit a small 4hr decision-point level positioned at 1.2509. This level could indeed see price bounce north here, but is not something our team would want to risk money on to find out. A convincing close below and retest of this level on the other hand would most certainly grab our attention, as the path south would then likely be clear down to at least 1.2419, a 4hr Quasimodo support level. Given these points, our team has agreed that standing on the side lines here may very well be the best path to take. Sell orders: Flat Predicative stop-loss orders seen at: N/A). Weekly Timeframe: The weekly timeframe shows that the buyers have recently pushed price back up to the weekly swap level coming in at 0.9529. A break above this hurdle would likely open the doors for further upside towards a weekly swap level seen at 0.9746. Daily Timeframe: Yesterday’s action shows that the market rallied up to a daily swap area seen at 0.9529-0.9568. A break above and retest of this area would likely inspire the buyers to continue pushing this market north towards a daily Quasimodo resistance level seen at 0.9740 (located six pips below the weekly swap level at 0.9746). 4hr Timeframe: Ever since the market opened at 0.9404, the buyers have been seen in overall control. 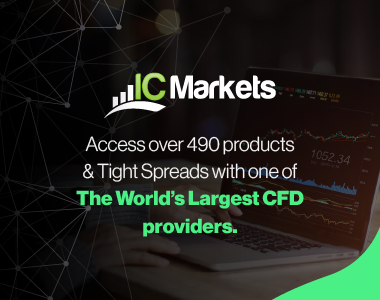 This consequently forced price to rally up to the 0.9500 handle, which, if you look back to the daily chart, you’ll notice it’s only 30 pips below the daily swap area at 0.9529-0.9568. At the time of writing, the USD/CHF pair appears to have found temporary support around the 0.9448 number. If the buyers can hold out above this level today, we may see price push above the aforementioned daily swap area. However, in the event that 0.9448 gives way, we could potentially see the market drop down to around 0.9450, which, as you can probably see, is a minor 4hr swap level. Therefore, with all the above taken into consideration, buying this market will only be considered once/if price closes above the daily swap area just mentioned. Selling on the other hand would only be permitted if price breaks below and retests 0.9450, as this would likely force the market back down to the weekly swap level coming in at 0.9382. Weekly Timeframe: The weekly timeframe shows that further buying was seen last week which consequently saw price close (18130) above the 18098 high. If the buyers can maintain their position above this number, this will likely suggest a more bullish bias going forward. Daily Timeframe: Yesterday’s trading action shows that the buyers are for the time being holding above the recently broken daily supply area at 18098-18045. Ultimately though, we would like to see price positively close above the high 18148 sometime today. 4hr Timeframe: The DOW, as you can see, sold off around the open at 18125. This forced the market back down to the 18098 region, which, as you know from the weekly analysis above, is a rather significant level to us. We plan to continue watching the lower timeframe price action around 18098 closely for any buy signals today, since we still believe a bullish reaction is going to be seen here. In the event however that this level fails, further selling will likely be seen down towards a 4hr swap area coming in at 18047-18014. Buy orders: 18098 [Tentative] (Predicative stop-loss orders seen at: dependent on where one confirms this level). Weekly Timeframe: The weekly timeframe shows that Gold has recently hit a weekly demand area coming in at 1166.8-1195.0. Assuming that there are active buyers here, price could very well rally back up to test 1222.2. 4hr Timeframe: Gold, as you can see sold off around the open (1202.6) and consequently hit a 4hr decision-point demand area at 1186.6-1194.3, which, if you remember, was the overall target for any shorts taken from 1217.3. Well done to anyone who stuck with the trade to the end! In our previous analysis, we also mentioned that the aforementioned 4hr decision-point demand area would in fact be a good place to begin looking for confirmed longs, as this 4hr zone actually represents the upper limits of the aforementioned weekly demand area (see above). As we can all see, a reaction was indeed seen from here, unfortunately though, we were unable to find an entry! However, if we were long, we’d be looking to ride this baby all the way back up to 1217.3. The reason for this is simply because the spike/wick seen marked with a green arrow at 1210.1 has likely consumed most of the major selling opposition around minor 4hr supply at 1212.5-1206.6, which is the only obstacle we see stopping a move towards 1217.3.